It makes me angry because I am a big fan of Microsoft. In my mind, every version of Windows since 3.1 has gotten better with each release (I will kindly forgive them for Windows ME). Each day I feel that in many ways, Vista is a step back in the usability department. This problem costs me time every day. I use notepad all the time. It is great for throwing together a script, or a to-do list. Text files work on almost every OS, so I can still read them when I am running Mac OSX. When I go to browse for a file I am shown this dialog. Notice that when I clicked on the dropdown it shows me a bunch of websites. A BUNCH OF FRICKEN WEBSITES! No, not the usual tree of folders, and My computer so I can locate a file. Sure, I can click on the left to one of my ‘Favorite locations’, but this takes much longer than the tree interface ever did. Oh yea. What happens when we select one of those websites? One other bone I have to pick with the new browsing interface is the difficulty in going back to the parent of the current directory. The new way makes going back up a few folders a much longer process. Simply stated there is no one button that will always bring you back up to the parent. 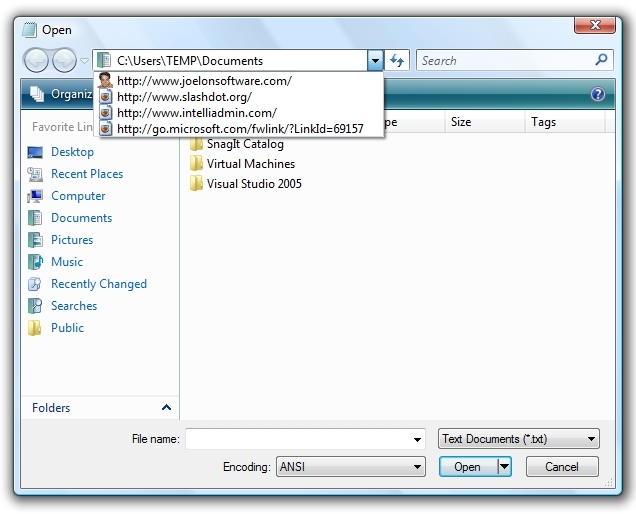 Keep in mind that this file browsing interface is in every new Vista aware application. When I first started using the new start menu I loved it. I usually have 100s of programs installed, and the new interface makes it much easier to navigate. But there is something also I do with the run command on the start menu. If I want a specific folder to launch in explorer I just type it out. 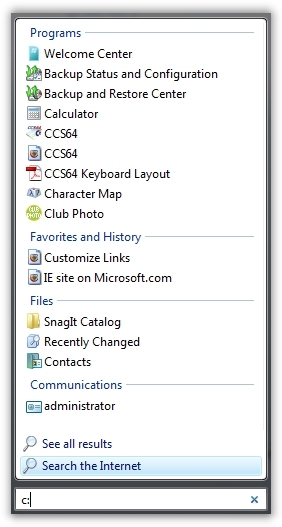 Click start, then run and type c: Press enter, and the folder will show up. I need to go into networking options often when going from place to place with my laptop. Since some places need a static IP, others need dynamic, etc. When I go into windows networking I am greeted with this. Look at all of the options I am given here. 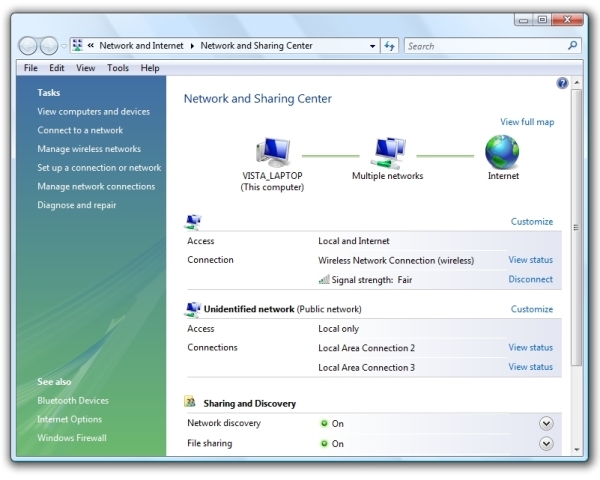 If you have never used Vista before – Quick tell me how to change the IP address on my wireless card! I think they could have split many of these options into totally different areas and made it much cleaner, and easy to use. Same as it ever was. Ever since they started messing with Windows Search in Windows XP Service Pack 2 I have hated it. It has fooled me so many times into thinking a file was gone, or nothing existed that matched by search criteria. Now when I want a simple search for any file that contains the string ‘IntelliAdmin’ I can’t do it. Instead of fixing what they broke in XP SP2, they just took it out! 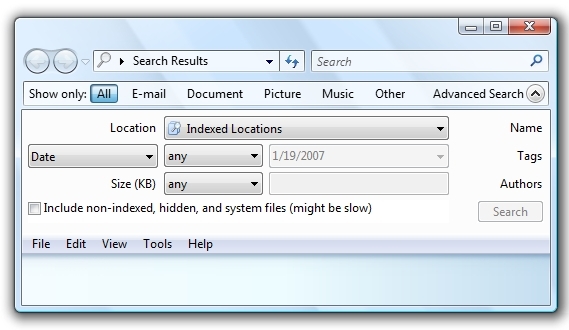 I want a simple search program that will search for a file on my hard drive (Hint to Microsoft – Every file, not just the types you know about like Word and Excel files) that contains a specific string of letters. It can’t be done any more with windows search. I find myself going to a command line these days and doing a wildcard directory search to get better results. How sad. Ever since the Chicago Beta was released to the world (You know it as Windows 95) I have hoped that the next version of windows would improve the file copying system. Sure they have made the interface look cooler, a snazzy progress bar here and there. What about a robust copy? I absolutely hate it when my 5000 file copy gets killed half way through because 1 single file can’t be opened. Or better yet, how about when I start a copy to a remote file share that is not responding – and all of explorer locks up. Yes it still does this in Vista. I have had to kill explorer on a few occasions over the last month and a half. In this regard Microsoft thinks it is perfectly fine for the UI to become unresponsive when the network is down. These are my user interface rants. Maybe one day I will write about stability issues, but I hate to do that since it is my single experience. Maybe the 99.9% of the other installations don’t have the problems I do… I will keep them to my self for now. I would like to know whether Windows 7 has (finally) solved these problems? I have also found my difficulties with Vista. Takes more time to do things. In many cases I cannot or can hardly find a way to manage preset parameters. I also hate the limited list of the found files, programms etc. that match a search word. It lacks a scroll option to go further than fits into the box. For the most part, yes. 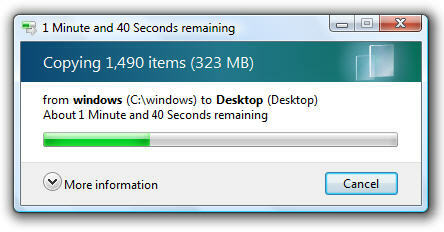 Network file sharing is blazing fast, faster than XP in fact. Those silly errors in the open dialog under notepad are gone, the network configuration has been re-organized to be easier…all around I think Windows 7 is a tight system, and worth the upgrade. What about the file search function and the copying function? Have those issues been fixed? Yes at least I have no issues anymore to search files or copy them. Well, don’t use it as the Run dialog, then? You can still access the Run dialog by holding down the Windows key and pressing R.
That hasn’t changed since Win95… 😉 And that, NOT the Windows Start Menu, is still my primary means of launching a program or specific location.